Disclosure: Please note that this is a color chart created by me, using my own photos of YKK zippers. I am an independent shop owner and not a YKK Employee. 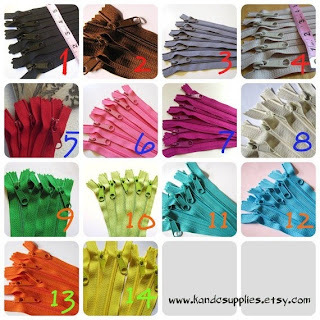 The color chart is a promotional tool for my Zipper shop, and I have all copyrights to it. If you would like to copy the color chart to your blog, please be sure to include a link back to my blog and comment on this post to let me know.